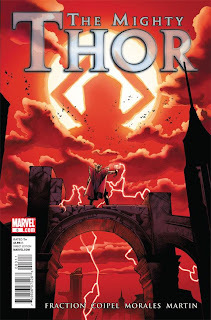 Stewart R: Just a couple of months ago I sat down and decided to crack through a Cover to Cover review for The Mighty Thor #1 and then some four weeks ago the difficult second issue wound up with 8 and 9 out of 10 scores from myself, Matt C and James R. When a series starts off that well the question of when the quality will dip often raises its head. I’m very relieved to say that with this particular title’s current velocity I shouldn’t think we’ll be expecting to see it dip from the lofty heights of its trajectory any time soon! Many reviews get stuck straight into the meat and bones of the plot but with this particular issue it really is quite a task to stop looking at that magnificent cover from Coipel and turn the page to the goodness within. It’s brilliantly composed, the banner title adding weight to the power and stature of the dwarfed Thunder God who stands firm, studying the silhouette of the huge unstoppable force heading his and Asgard’s way. The colouration is perfect too - Martin bathes the whole page in a glorious blood red glow that really does add to the sense of foreboding. When this arc eventually gets collected in trade form I imagine someone at Marvel is going to have quite the head-scratching session deciding what delicious piece of Coipel art should adorn the cover! Once you do summon the strength to pull yourself away from that cover and turn the page it’s clear that Fraction really is working some magic of his own. The opening scenes are touched with comedy and capture the fractional opinion of the citizens of Broxton as those with strong Christian beliefs and and a ‘not in my backyard’ attitude voice their stance to Volstagg who happens to be on a quest to impart his ‘masterful’ knowledge. Both writer and artist play with the humour here - Coipel seemingly poking at a few bible belt stereotypes with the dour faces on show - and Volstagg, being the perpetual Asgardian joke that he is, fits the bill perfectly. It may be unintentional I dare say, but there’s something a little ‘Obelix’ about the rotund god’s attitude to his public shunning by the 'tiny men' of Broxton and I for one don’t mind Fraction channeling a little Goscinny and Uderzo here when it works this well. 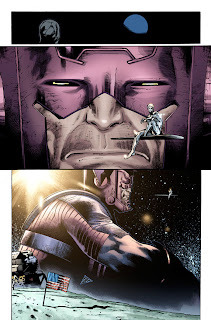 Fraction’s choice to open on such a light note helps to keep the plot grounded and acts as an appetiser for the high-powered meeting of Marvel’s heavy-hitters that takes place next as the Silver Surfer is set upon by an agitated Thor before he can put across the terms of his master. 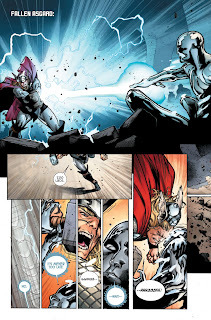 The reigns are once again handed over to Coipel to deliver the swift and kinetic encounter and the sense of speed is tremendous as hammer-wielding Thunder God and the silver herald go at it. 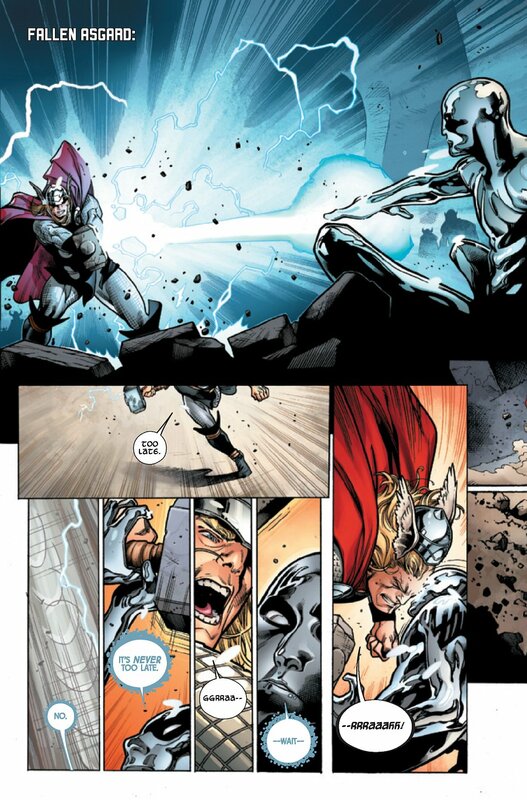 It’s not long though before hostilities are brought to a conclusion and Fraction then cleverly mimics Volstagg’s dismissive attitude to Broxton’s deity of choice at the start of the issue in the Surfer’s ‘tête à tête’ with Odin, which suggests that the Asgardians do not rank highly on the galactic scale and do not fully understand what awaits them should the world seed not be handed over. 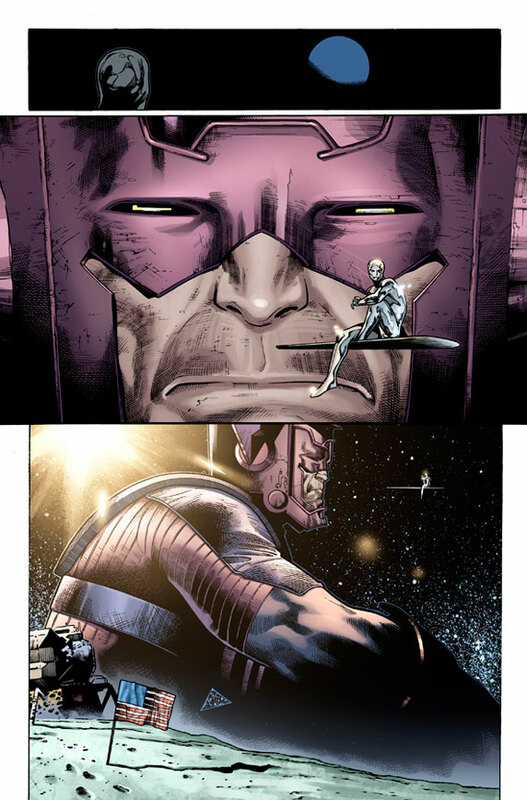 I really do enjoy the characterisation that Fraction squeezes from the dialogue with the Silver Surfer’s plain and direct delivery being matched with an older and grandiose manner of articulation from the All-Father.